Here it is November, and my favorite holiday is coming up. I love Thanksgiving more than any other day of the year. I’ll get up early, make coffee, put the egg casserole in the cold oven and start it baking. Then DH and I enjoy breakfast while watching the parades, and start in on football after that. At the right time, the turkey goes in the oven to fill the house with that aroma of Thanksgiving, turkey and dressing. Bubbling gravy on the stove, warm yeast rolls in the little oven, a side dish of spinach or broccoli, and cold jellied cranberry sauce in my grandmother’s cut glass dish complete the meal. Generally we eat at half time of the afternoon game. Of course, a beautiful tablescape is essential for this holiday. 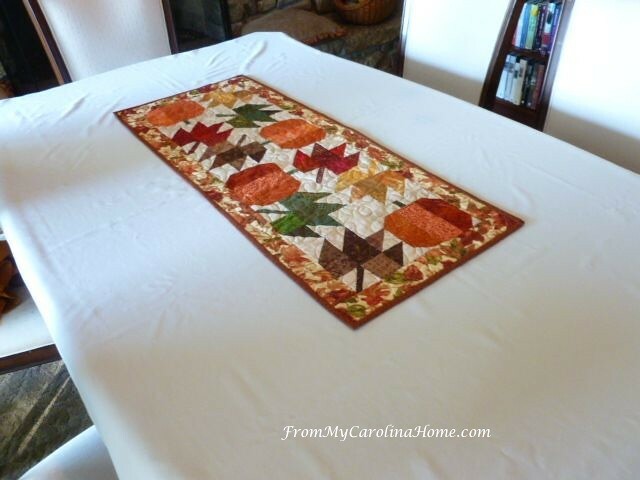 I began my tablescape this year with the Autumn Leaves and Pumpkins quilted runner from last year’s Autumn Jubilee as the base of the tablescape, taking advantage of the vibrant colors. I put it on top of the ecru tablecloth. The centerpiece was built with the tallest elements first, my pilgrim couple. 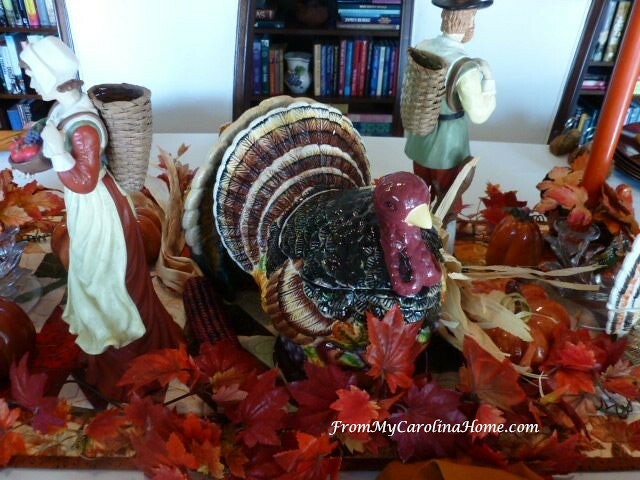 Inherited from my mother, these statues are tall and heavy, and the most precious of my Thanksgiving decor items. The pilgrims go in different places in our home each year, and this year I decided to put them on the table, flanked by tall rust candles in my Fostoria depression glass holders. There is so much detail in the faces, hands, clothing, and the items they hold. This year I left the gathering baskets on their backs empty, but those could hold small bunches of flowers. Garlands of fall leaves were added next. See the detail in her dress and apron, and the pumpkin and tree branch at his feet? This centerpiece display was taller than I usually like, so larger turkeys from my collection went in the very center, creating a lower spot for diners to see the guests on the other side of the table. This one is really a cookie jar, and last year sat on the kitchen counter. Small ceramic pumpkins and smaller ceramic turkeys fill in the open spots, and candle rings were added to the candles. A new acquisition for this year, I found some turkey place card holders, how fun is this!! I’ll create some place cards with our guests names for them. This year we are having a dinner on Friday instead of the holiday itself. The nutmeg spice napkins are held with turkey napkin rings that say Happy Thanksgiving, also inherited from my mother. When my friend, Teresa, told me she had a set of gold flatware, I talked her into letting me borrow it. The warmth of the gold works wonderfully with the plates and copper color chargers. White china plates go on the chargers, with my fabulous turkey salad plates. These were a Pottery Barn score, I just fell in love with these plates. I use them for breakfast and lunch during the month of November too. Plates this fun have to be used as much as possible during the one month of the year they come out. 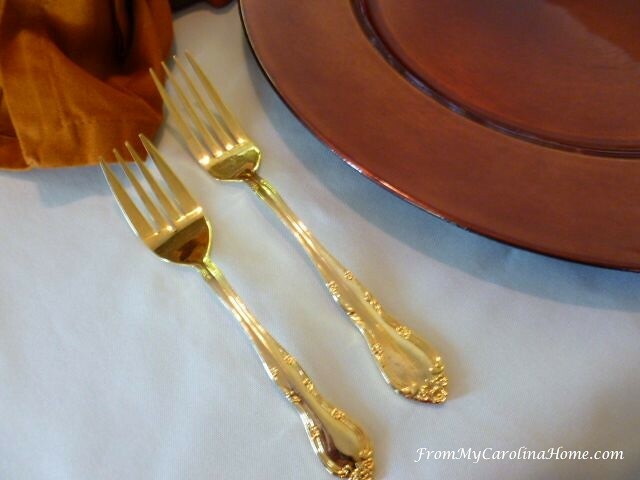 The gold rims and the metallic gold in the design pick up the warmth of the gold flatware nicely. Two gold rimmed wine glasses from a thrift store score last summer are set at the end places, then the other places got pretty cut stems, also thrift store scores. Individual salt and pepper shakers, and crystal knife rests complete the place settings. These colors make my heart sing at this time of year, mirroring the colors in the trees outside. I just realized that I didn’t put the bread plates on the place settings, so I’ll add those later. No, I don’t mind one whit about having to wash a lot of dishes, there are only a few times a year that I get to go all out! I hope it will be cold enough to enjoy a fire in the stone fireplace during the meal. There is room on the four corners of the table on the sides for dishes of food. One more look at the completed table. What are your plans (or what did you do) for Thanksgiving this year? If you don’t have Thanksgiving in your country, do you have a celebration of Autumn? 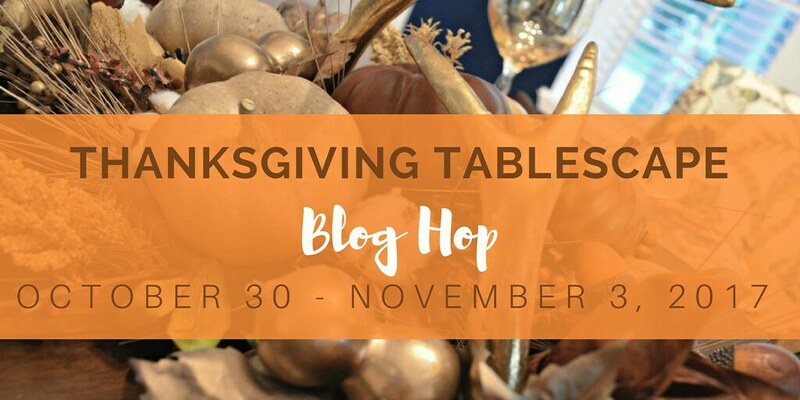 Now for more fun and great ideas, I am part of a Thanksgiving Tablescape Blog Hop hosted by Chloe at Celebrate and Decorate. Visit all these fun blogs for more wonderful tablescape ideas. that runner is gorgeous! is the pattern still available? 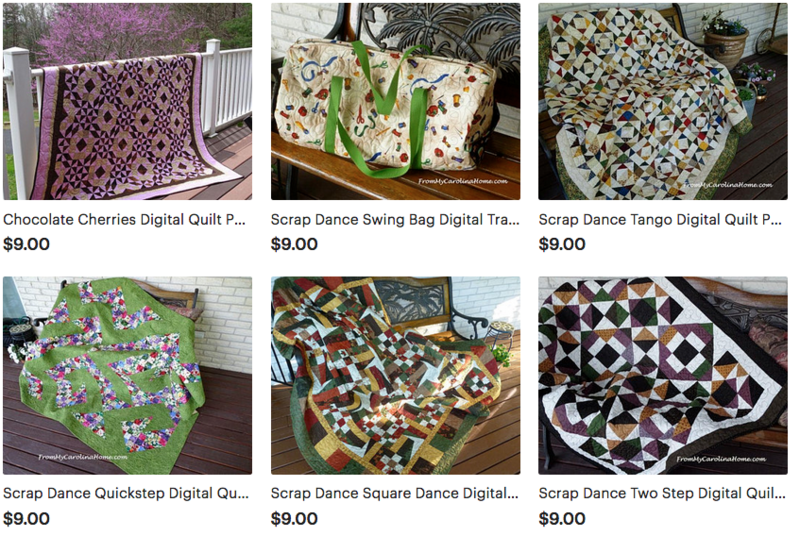 Yes, go to the Friday posts in the month of October 2016, it was last year’s quilt along. Those are the most beautiful turkey plates!! Let’s face it, the turkey is not the cutest or prettiest animal on earth, so it isn’t often that I say those are pretty turkey plates!! BUt there is something about the coloring in these plates that I like, and I think you picked up on that perfectly with your setting. I love that one of your turkeys is actually a cookie jar, good use of it as part of your centerpiece. What a wonderful Thanksgiving table and I am happy to be hopping with you today! You set such beautiful tables. I love all your seasonal special items. I know they hold dear memories for you. Carole, Happy November! Your description of Thanksgiving is perfect in every detail, and so is your table. Your love of the holiday is apparent, and it’s also apparent that your mother must have loved it just the same, given your wonderful pieces you’ve inherited from her and are using in your table. It is the method of your assembly and how/where you’ve gotten all the elements (vintage love!) that I enjoyed reading about, not just how great they all look together. 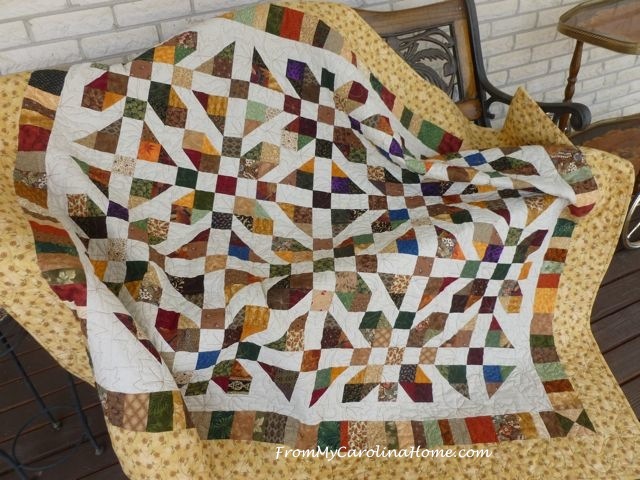 That quilted base is gorgeous. I just love hand-made textiles. You’re so right – the table mirrors the colors in our beautiful landscape. WV is much like NC in its array of fall beauty, and we are so fortunate to be able to be immersed in it. Thank you for sharing your tradition of Thanksgiving with us! Beautifully done! The center arrangement is fabulous. Great way to use the various turkeys and your mother’s pilgrims. I have those turkey plates too (I have them too!). Your table setting is beautiful. It looks so inviting and cozy, especially with the stone fireplace in the background. 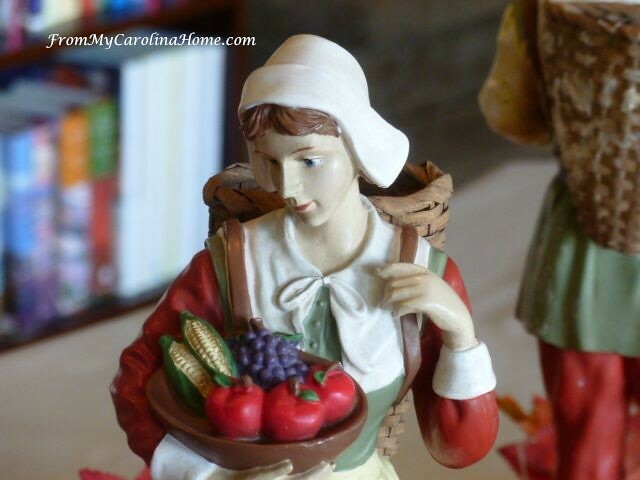 And the pilgrim couple is awesome; it is wonderful to have these sentimental items to enjoy. Carole, your tables are worthy of Better Homes and Gardens! Congrats on a great Autum Jubilee this year, it was the first time I saw the entire month, and you really worked hard on that, with great sponsors and variety. I enjoyed reading your posts, and hope to try a project or two, just got backed up with stuff on the must list! I am inspired by your tables, and really enjoy the way you utilize things to make the scapes. I did not come from a decorating family, so my supplies are nonexistent, but I see how I can make things more festive with just a tweak here and there. Our Thanksgiving is up in the air, with both Girls not coming home. We may ask to volunteer at the Mission, and help cook their dinner. 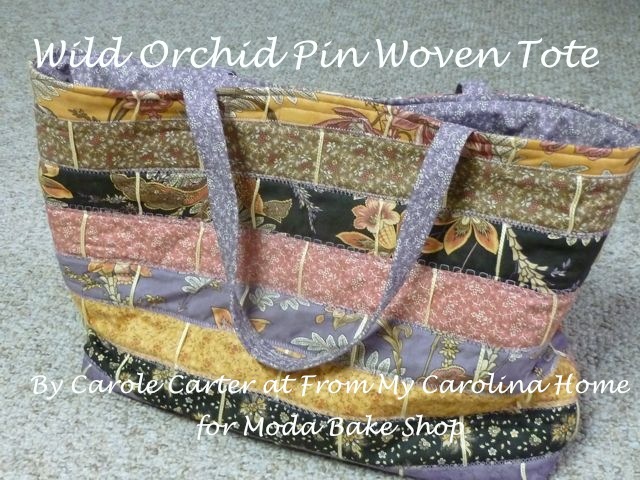 It looks wonderful Carole! Those turkey plates are the crowning touch, so pretty! Your day sounds perfect, from breakfast to football to dinner! The perfect day~ your quilt of course is beautiful, and those pilgrims! Have a wonderful November! 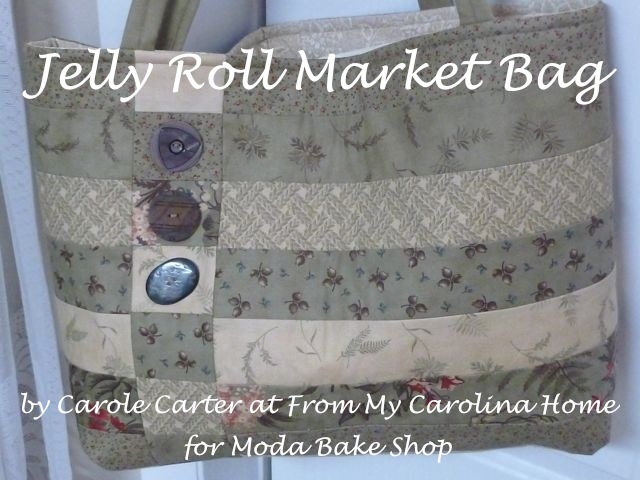 Carole, Your quilt runner and mountain view from your home is amazing. A lot of love and talent went into the making of the runner. That should be a cherished heirloom. Thank you for the step by step progression of the styling of your table. I am amazed at your pilgrims, napkin rings and turkey collection. Love those plates too. It looks beautiful. You always have such lovely table settings. 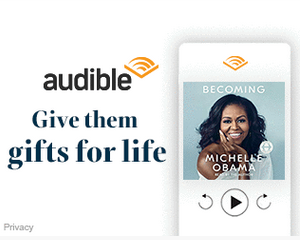 I wouldn’t mind decorating all up like that but no one would really appreciate it – they don’t like to sit long enough – more of a buffet, grab what you want and get back to the football game – no sense of appreciation! 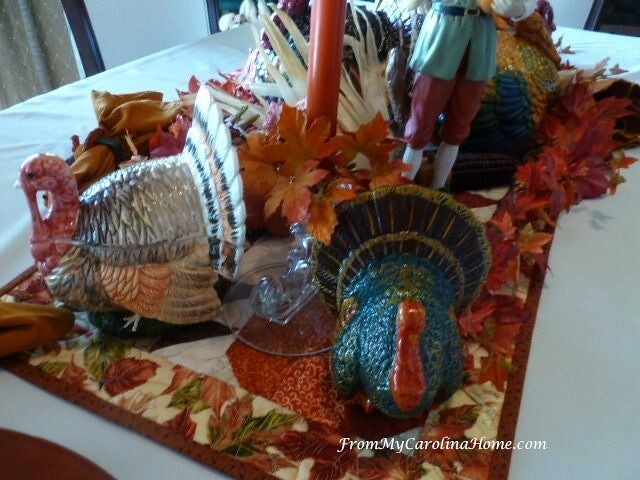 Carole, your quilted runner is the perfect foundation for the spreading centerpiece! 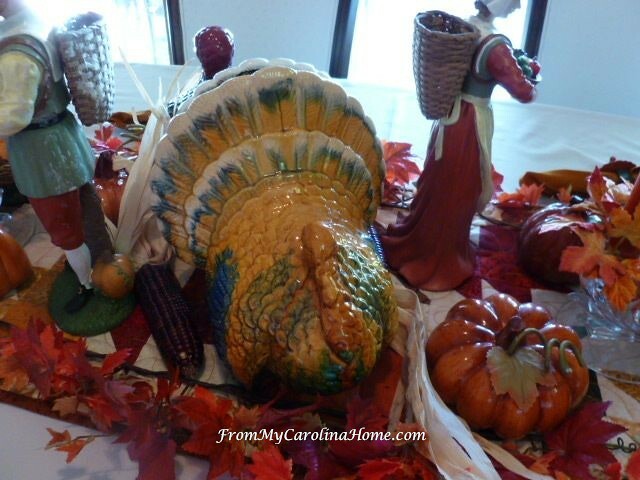 The inherited pilgrims are the stars of the centerpiece, but your ceramic turkeys are certainly mixed in beautifully! The turkey salad plates complete your lovely Thanksgiving table! I know your family will enjoy putting their feet under your table! I just love all the turkeys! And, those plates! What a find. It has reminded I haven’t been to Pier One in forever. Time to stop in! So glad your friend loaned you her flatware, as it looks stunning on your table. 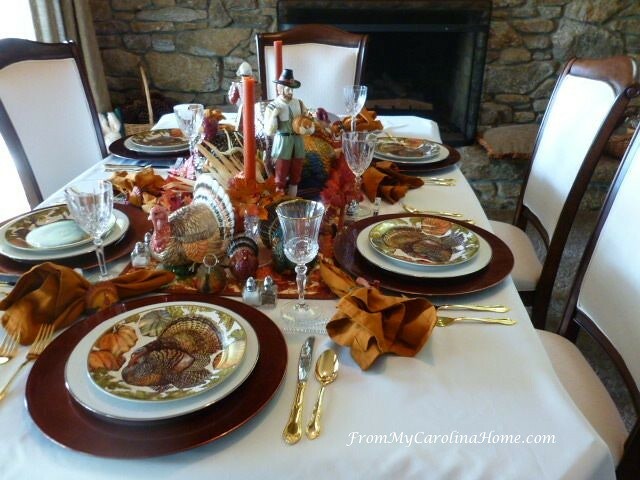 Certainly a warm and welcoming Thanksgiving tablescape I could imagine sitting down at myself! 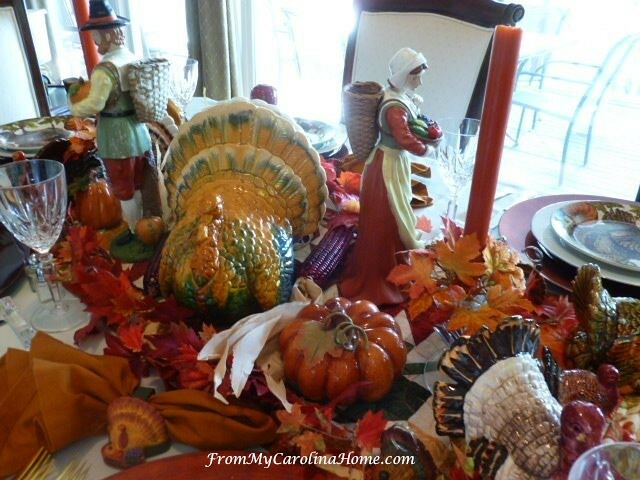 What a beautiful Thanksgiving table, Carole! Your runner is gorgeous as well as your wonderful collection of turkeys and pilgrims. They add such wonderful traditional fall color to your table. The pretty turkey plates add the perfect finishing touch. As ever, beautiful tablescape! Well, actually, not as usual….it is OVER THE TOP beautiful. Thank you for sharing! 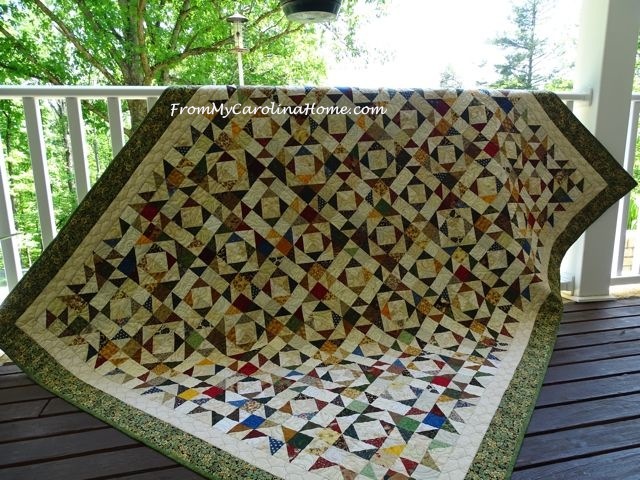 Carole, I love your quilt runner, My step~mother was a champion quilter and I always am drawn to beautiful quilts. Love those pilgrims too. A very pretty setting. 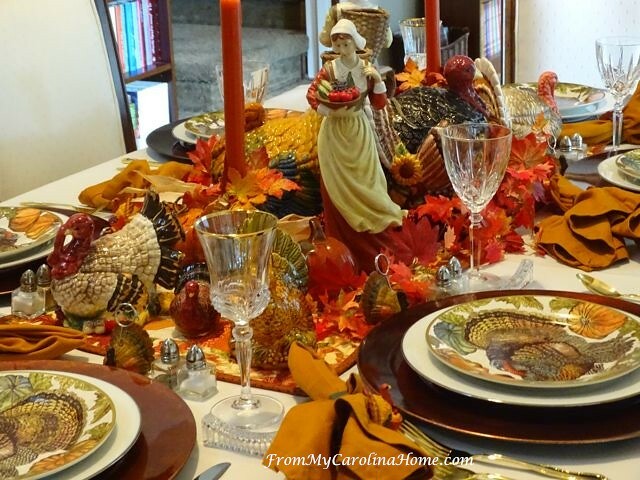 What a gorgeous tablescape, Carole. I especially adore your pilgrim couple. I can understand why they’re near and dear to your heart. 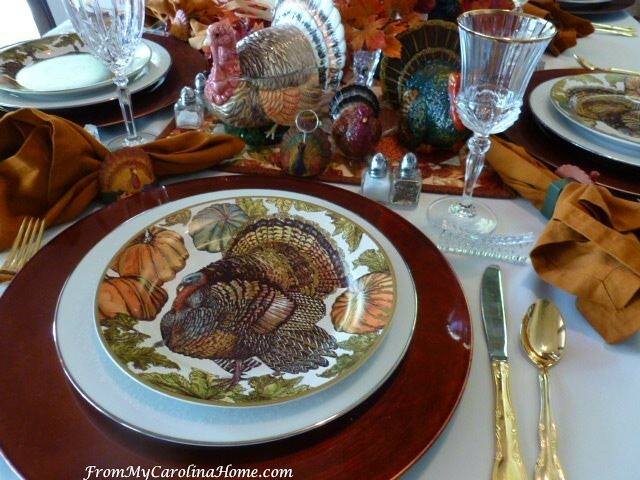 The turkey collection is fabulous and the plates tie it all together. 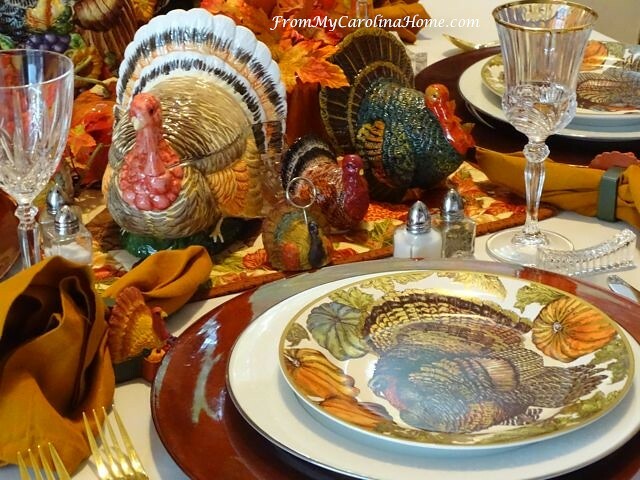 Your tablescape makes me want to get out my Thanksgiving deco right NOW!!! Totally lovely!! Thanks for the inspiration. beautiful of course. I have NO idea where you find the space to store all your lovely table items for the seasons! We finally got a small storage space for our Christmas decor, and I hardly had any out last year! This year we should have an actual dining room, son is almost finished with his garage re-do into their living room/media space, and our eat in kitchen will now have a dining room. I have the maple leaf runner just about done, and I have fabric pumpkins and a lovely centerpiece with a lantern and fall flowers and foliage. My good dishes are blue though, maybe we should think about some plain white, and I have a set of Christmas china hidden away, so white would cover other holidays. Sigh. You’re an inspiration dear lady. Thank you for taking us step by step in the design of your table. It’s full, lush and a perfect Thanksgiving tablescape. Those turkey salad are beautiful and I agree that they should be used as often as possible. I hope your holiday is peaceful and fun and it was a pleasure to blog hop with you again. 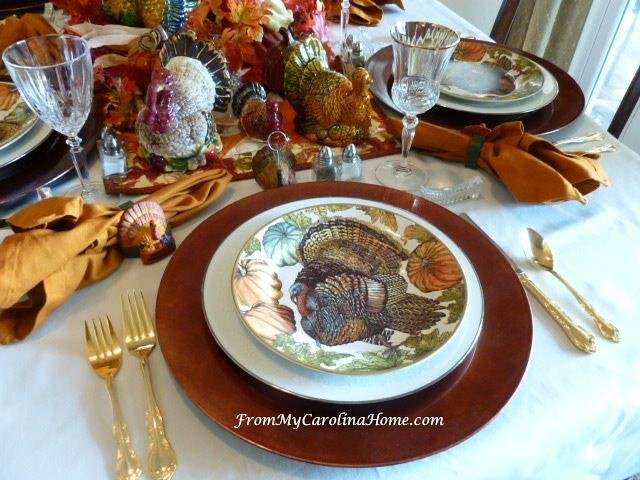 Hello Carole; You have mesmerized me with your artistic tablescape! I always want to go to garage sales and all of our second hand stores plus the three or four antique shops we have downtown also to start collecting my own table settings. Only, it is usually just Kevin and I and we rarely eat at the table because it is covered in quilting items! LOL. 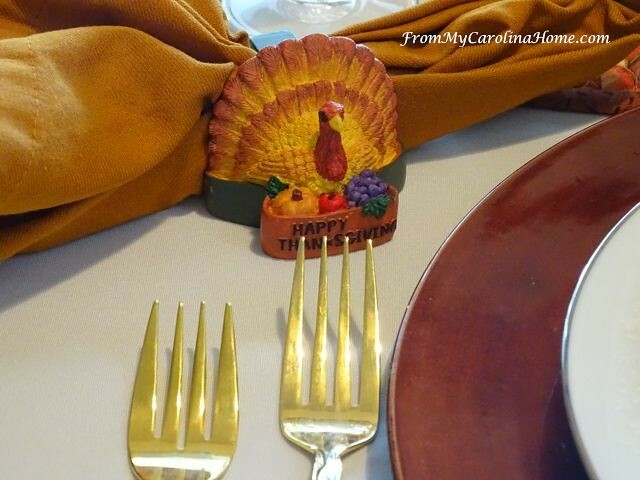 Your Pilgrims are spectacular, besides being your Mother’s, I can see why you treasure them being the collector of items that really hold firm to a Holiday Table Setting. I also love your Turkey Plates. They are so pretty and as you said a great reason to use them throughout the season. You always make me feel fabulous when you set up your table! I can just feel the delight that you have while doing it and enjoying it throughout the season! As always, I love and cherish that you share these moments with us! Thank you and have a great day! Your menu sounds delicious and your table is just beautiful! The turkeys on the table at perfect for a Thanksgiving meal. I really would like to have some plates like yours for my table. 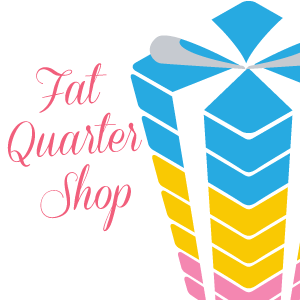 I enjoyed doing this blog hop with you! Beautiful treasures to display, and have those memories alive. The pilgrims have such delicate and intricate details. 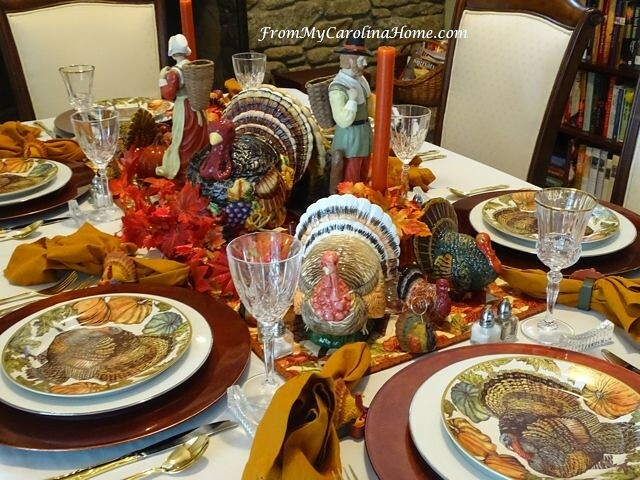 Carole, you really captured the essence of a Thanksgiving celebration with this tablescape. 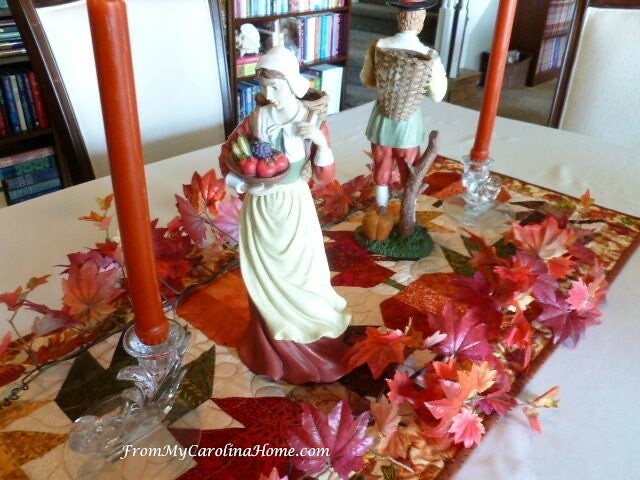 From the patchwork quilt table runner, to the Pilgrim figurines, to the Turkey adorned china. I like how you complimented the traditional colors with the elevated style of the gold flatware and crisp white table linen. You did a beautiful job on this tablescape. 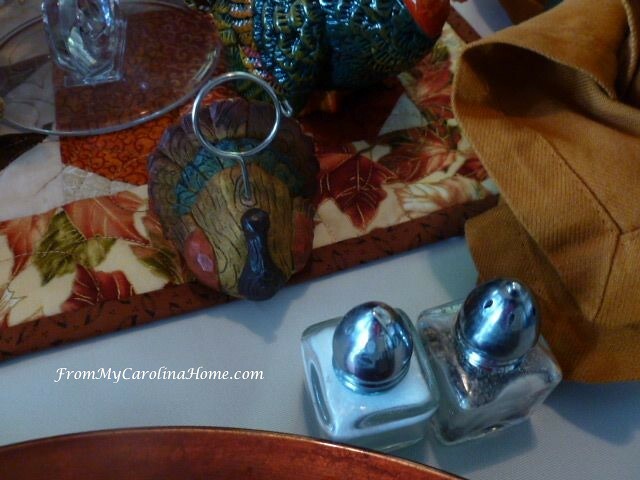 I am thankful to have you as part of my tablescape blogging tribe. 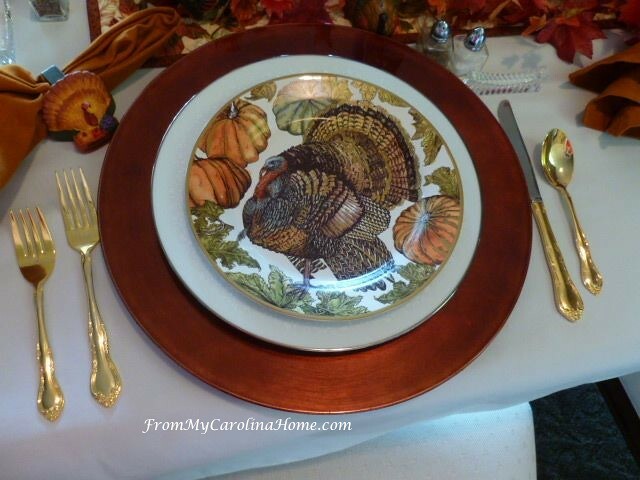 Carole, I love your handsome turkey plates accented by the copper charges! They set the tone for the table along with your wonderful quilted runner. It would be wonderful to enjoy your Thanksgiving meal by the fire. Your table setting is beautiful. No Thanksgiving celebrations here, we might decorate the table at Christmas time. Carole, this is extacly my (italian) idea of Thanksgiving! 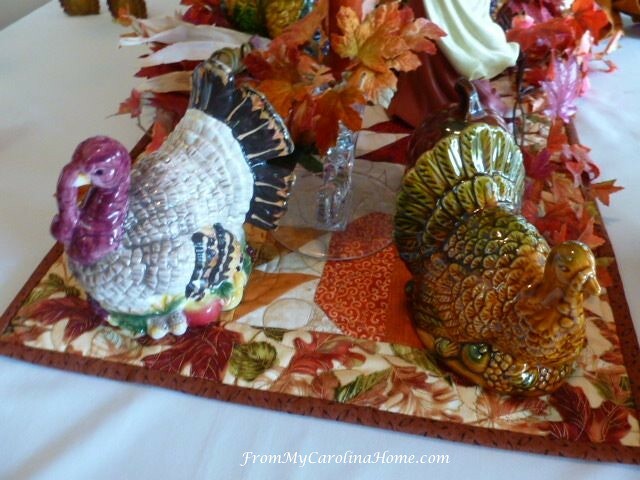 Fall colors, quilt, a lot of turkeys, pilgrims figurines… I absolutely love it! So beautiful! Thanksgiving is my favorite holiday as well! Usually, we have at least 15 for our big meal. This year, a daughter-in-law has offered to host for her family and ours. I am delighted and will probably offer my Medford chicken dishes as I have plenty. I just love your turkey plates – sure wraps up the holiday!! I love the way you layered in all the wonderful fall colors. Your table is perfect for the upcoming holiday! Those little Thanksgiving turkeys are the cutest! I love the pilgrims too! Great step by step on to put it together too!! Lovely table! Your table is beautiful and festive, Carole. 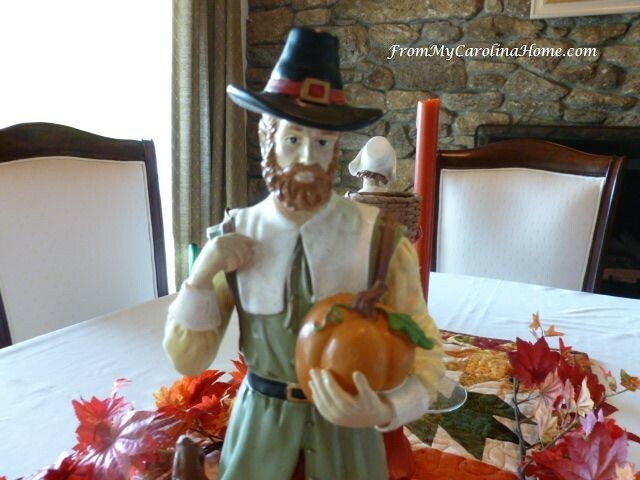 The pilgrim figurines and turkey are lovely reminders of the holiday. Your holiday morning came to life so vividly—your traditions are cozy and happy. I love to putter around the kitchen on a holiday morning, too. Enjoyed playing with you this week! 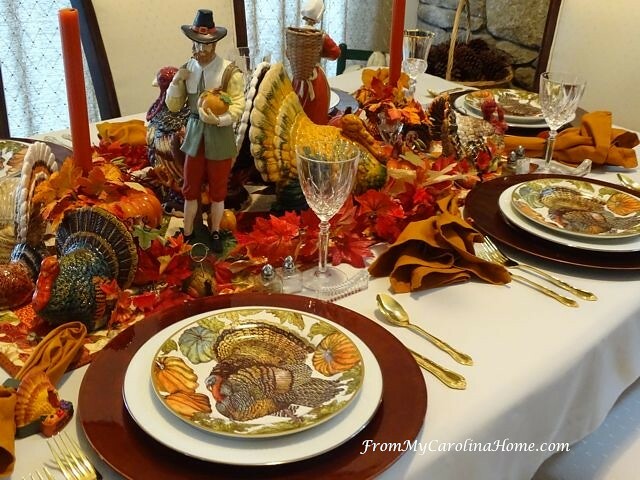 Love your tablescapes Wishing you a happy Thanksgiving. From Queensland. Australia. Where it is hot. Your table is so gorgeous and perfectly set for Thanksgiving. 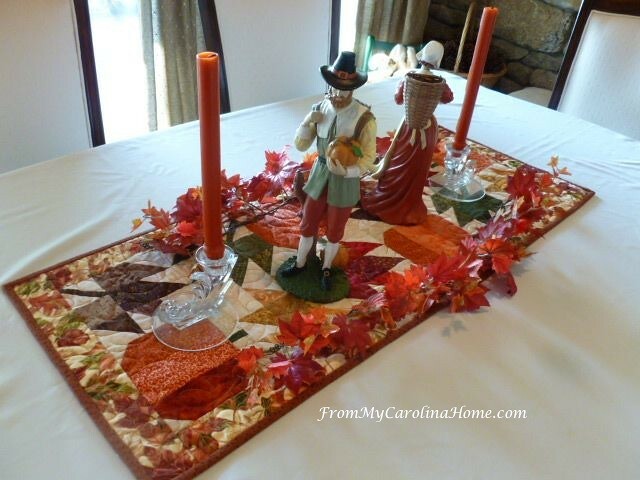 You’re very fortunate to have the heirloom pilgrims because, along with the beautiful quilt, they make your table so welcoming for anyone you have for Thanksgiving dinner. I’m so glad to meet you through this fabulous blog hop Chloe has arranged. Beautiful in every way! Love the layers and traditional colors. Your Pilgrims are perfect on the table! This post will be Featured at the new Merry Monday party starting tonight.